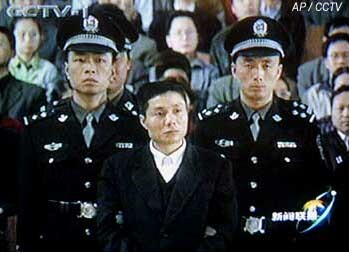 On this date in 2001, an infamous crime lord and 13 members of his gang were put to death in two Hunan Province cities. Suave serial bank robber Zhang Jun had a reported 28 deaths on his conscience, including such underworld classics as forcing a lover to execute someone in order to prove her loyalty, in a years-long spree of robbery and mayhem. He was a major catch early in China’s execution-rich “strike hard” crime crackdown. Despite-slash-because of the body trail, the cool Zhang — who appeared in court dressed modishly and flaunting such indifference to death that he disdained to defend himself — attracted a strain of fandom for his “gangland chic”. He’s kind of like the gangsters in the movies, really likable. The authorities, and his many victims, liked him less. A still shot from the broadcast of Zhang Jun’s trial. According to Courts and Criminal Justice in Contemporary China, the gang’s trial had the distinction of being the first ever broadcast live in China.